What if there was a way to get all your students quickly up-to-speed on the building blocks of critical thinking, close reading, and academic writing? With ThinkCERCA's new CERCA Starter literacy toolkit, educators can do just that. 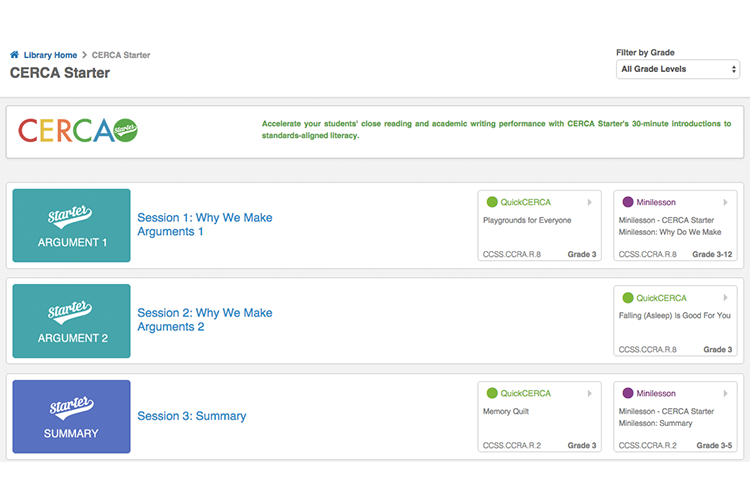 From learning Why We Make Arguments to How to Make Claims, CERCA Starter's free lessons and evaluations are designed to introduce your students to standards-aligned literacy concepts and vocabulary. What's more, these lessons come with built-in leveling assessments to provide teachers with insights into their students' literacy skills before the school year gets underway. CERCA Starter contains 30-minute lessons designed to introduce students to the basic concepts behind argumentation. In just eight sessions, they'll be equipped with the necessary background knowledge to excel at literacy across subjects and tackle other ThinkCERCA lessons throughout the year. Here, we put together some tips and best practices for getting the most out of CERCA Starter as you and your students kick off the 2015-2016 school year. Each CERCA Starter lesson (except for Lesson 2) includes one Minilesson and one QuickCERCA lesson. Minilessons are short, expert-designed introductions to standards-aligned skills, and QuickCERCAs contain high-interest informational texts followed by five automated assessments to gauge overall comprehension. Instruct students to complete each Minilesson first before they continue on to the accompanying QuickCERCA lesson. The Minilessons introduce students to the new concepts while the QuickCERCAs give students an opportunity to put the skills they just learned about into practice. Each CERCA session should take approximately 30 minutes. We recommend assigning the lessons one at a time so you can review student data before assigning the next lessons. ThinkCERCA makes it easy to assign each student lessons that align with their readiness level. Choose an appropriate level to start within your Class Roster, and after students complete each lesson, you can adjust their grade level according to their performance. Check out CERCA Starter and jumpstart your students' close reading and academic writing skills this school year.